Is personal mobility, with the arrival of the eVTOL (i.e. electric aerial vehicle capable of taking off and landing vertically) and car-sharing, on the brink of the same sort of disruptive change as personal communication was with smartphones and social media? If there is to be some sort of device, what would such a 'Fly & Drive' APParatus be like? And could this form the basis for a post-UBER business model? Topics in this particular blog, including the two mentioned below in blue, were covered in the presentation author gave for the American Helicopter Society (AHS) on occasion of the 5th Transformative Vertical Flight Conference, which was held in San Francisco, January 2018, co-hosted by NASA Ames Research. The AHS is the foremost organization in the world that is dedicated to the advancement of next-generation rotorcraft. Two years ago the book 'Hooked - How to Build Habit-forming Products' shook up the marketing community and Silicon Valley. Using i-Phone and social media feels intuitive, as an extension or even 'can't-do-without' part of our daily routine - it's why they became so hugely successful. The 'habit-forming' starts with a service or product being readily available, hiatusless, convenient. A lot has to do with 'packaging' - having separate cars and eVTOLs wouldn't be that much different from how it is done now, with helicopters. 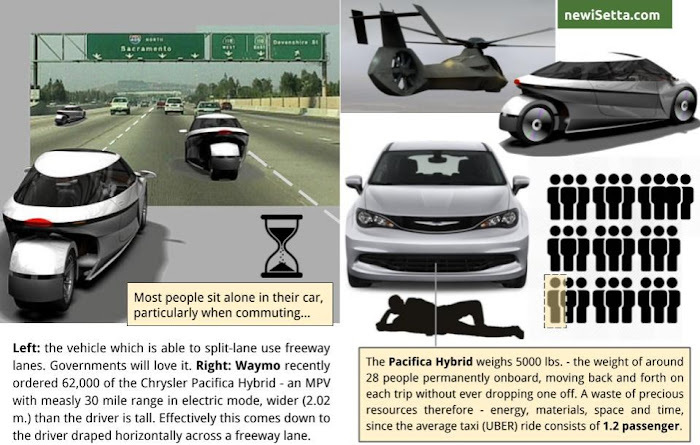 In my previous two blogs I explained why modular-linking car and eVTOL is better from a logistics and real estate perspective, it also makes point-to-point transit a seamless experience, as passengers remain conveniently seated. 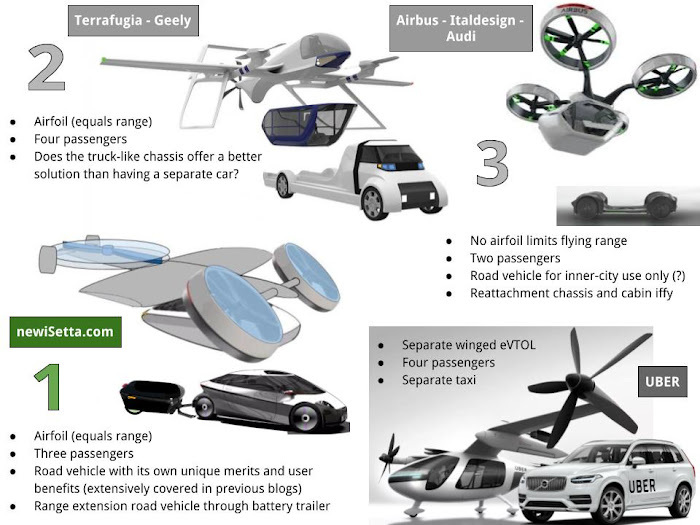 Below are the three modular flying car concepts known so far (vs UBER's separate eVTOL and taxi). The real benefit and gain would be when the eVTOL leads to reinventing, what's called in logistics, the feeder and distribution vehicle, the car which takes you to and from the eVTOL. In many countries the car is already forced to 'make amends' - road pricing, inner city access and parking fees are or will be related to the car's emission profile and eco-footprint. Remember the tailfins and jet exhaust-like taillights of cars from the 50's? All sorts of aviation motifs used to flavor car styling. Now aviation can have a more profound influence on automotive design and how we can use road vehicles more intelligently. The eVTOL can help to introduce the type of EV which car makers would probably not be considering if it weren't for the prospect of making it fly. At the same time the electric vehicle expands the eVTOL's operational reach substantially, which is interesting for aircraft makers who are interested in the eVTOL market. Because of its modular setup, the EV may well be purchased, leased, rented, share-used or personal-used in a ratio which exceeds eVTOL use a few times or maybe many times over. Interestingly, Daimler and BMW plan to cooperate on car-sharing, and may soon raise the bar even further since Daimler took a stake in Volocopter which is bringing the first operational eVTOL. BELOW: it completely goes against the trend of cars becoming bulkier, but this Comanche helicopter-inspired electric vehicle is also meant to squeeze through and fly over traffic. Personal communication, bridging distances through wireless, has made spectaculair progress. Interestingly, physical transit from A to B hasn't quite caught up yet. Passenger cars are still being operated as 'standalone systems' no different than when the car was introduced more than a century ago. Perhaps it is time to put the lessons we've learned with personal communication (utilize infrastructure, bandwidth, point-to-point, provider-managed, subscription-based) to good use when it comes to personal mobility, and start seeing 'auto-mobiles' in terms of mobility apps, household appliances almost. Look at the infrastructure - often overlooked, even ignored by the industry. Now think of our roads in terms of bandwidth and cars clogging up arteries. It's hugely expensive to expand infrastructure, and a lot of times even impossible. So, why not look for ways to utilize existing 'road bandwidth' more efficiently, for ways to 'unclog' arteries and improve throughput? Time to put the car on a diet, make it sleeker, lose weight and have it run much more efficiently on batteries. With ever-increasing mobility (and the number of occupants per car dropping! ), it will be a matter of time before city governments start differentiating according to vehicle footprint in determining inner city access, road pricing and parking tariffs. National governments already do of course according to vehicle weight, fuel consumption and emissions. Then again, people don't particularly like 'small cars' - cars derived from something bigger (with more 'road presence'). So, don't come up with yet another 'small car'! Bring something else. Global car sales in 2017 were around 90 million. Selling 90,000 each year is considered a number a manufacturer can work with - that's 1 percent of all cars sold worldwide. Doable when it has the unique feature, the extra option that you can actually escape traffic in it by flying off. 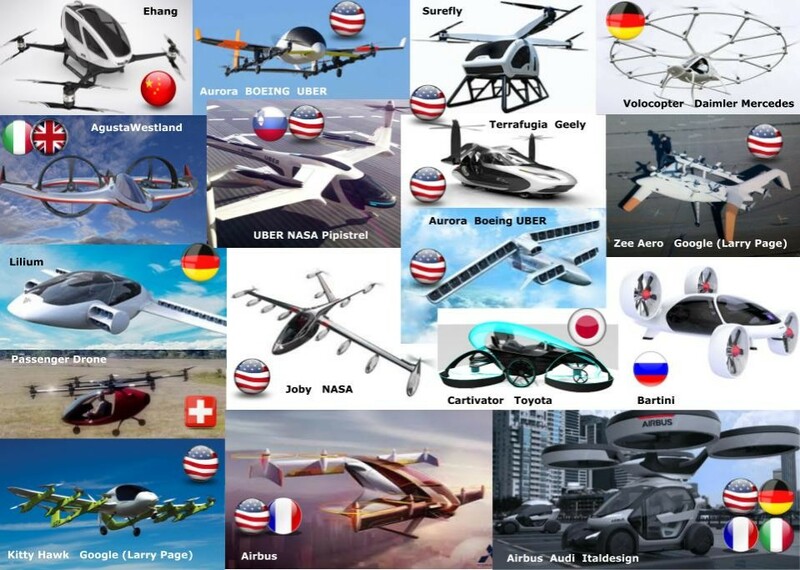 Again, not all of them need to be used in combination with the eVTOL. Now there's your post-UBER business model - the trick is in the linkage. Below you can see how relevant aspects interlock, and how 'lightweight' and 'sleek' form the key to unlocking the potential. Electric propulsion, self-driving and car-on-demand are today’s biggest, automotive challenges, right? It helps to do some out-of-the-box thinking. I mean this literally: outside that boxy thing that’s parked upfront. Instead think: personal-mobility appliance or Auto-Mobile... Sleek, lightweight and versatile, it may be as disruptive as THE ‘appliance’ in personal communication… the smartphone.